Here are the Mavericks, in the midst of playoff run, down a trail littered with doubters and naysayers, one step away from their goal only to find Teddy "KGB" waiting for them once again. It's not often in sports that a team or player gets their chance at a Mike McDermott moment, but the Dallas Mavericks have a shot at redemption that eerily parallels the tormented poker player's road to glory (at this point, if you haven't seen the movie Rounders, then you have no idea what I'm talking about. You should rent it and thank me later). The Mavericks have battled their way back to the NBA Finals to find the Miami Heat waiting for them at the poker table once again. The stakes are even higher this time and the feeling of being truly "all in" resonates with Dirk and his teammates in Dallas. Given the state of perception of LeBron's "Decision" and the way the three all stars stacked the deck to try to create a basketball monopoly, there could not be any better story line than having them pitted against the beloved hero who stayed home to finish what he started. Both teams have been on a tear this post season trying taking care of business to reach their ultimate goals. Miami is now 8-0 in the playoffs on their home floor while Dallas is now 10-1 in the past month of playoff basketball winning their past 5 games on the road- something has to give. Dallas took the regular season series 2-0 while posting an ADS/ADS+ of 13.1/11.8 against Miami in doing so. The Heat on the other hand managed a very ugly ADS/ADS+ of 16.4/14.7 against the Mavericks. Most analyst will chalk up the Heats early struggles to lack of chemistry (which is plausible), but how about some credit to the make up of Dallas giving Miami trouble. It should also be noted between the teams meetings on 11/27/10 and 12/20/10, Miami did not lose a game, going 12-0. After the Mavs beat them in the second meeting, ending Miami's 12 game winning streak, the Heat went on to post another 9 game winning streak. A team can't be playing that bad to combine for a 21-2 record during a 6 week stretch in the NBA. There are things to breakdown from the early season series matchup as well as the 2011 playoff statistics. The Mavs and Heat are playing such high levels of basketball right now there is more to discuss than just Hollywood headlines. Last series Dallas had to slow down the all star combination of Durant/Westbrook, which they did quite well. Now they face another combo of All Stars, in James and Wade, who are unequivocally a more dynamic duo than the Thunder duo. 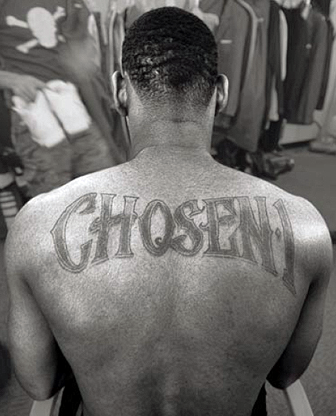 LeBron James has been the "chosen one" to lead the Miami Heat in the playoffs and has been torching his opponents while doing so. He has posted an ADS+ of 11.3 while shooting 46.3% from the field and averaging 26PPG. It will be a tough task for Dallas to slow down the King of South Beach in this series, though not impossible. LeBron is capable of having an off night like he did in the regular season against the Mavs, combining for 31% shooting for only 21PPG. Once again, it should be taken with a grain of salt but don't completely dismiss what the Mavericks were able to do against LeBron. During the playoffs LeBron has shown signs of an improved mid range jumper, but it can still act as his Achilles heal. His Made/Miss ADS is 10.6/14.9, a differential of over 4ft, will indicate the same thing for LeBron as it did Durant/Westbrook/Harden- make them shoot as far away as possible. Just slowing him down would be great, but doing so will be a task of maximum effort. Should Dallas exhaust fouls and defense intensity trying to stop LeBron James or look at the other parts of 613 gang? If you're going to have to pick your poison of the two, Dwayne Wade has been less effective as of late compared to LeBron. Not exactly the most encouraging thought for Dallas, since he was able to post an ADS+ of 9.9 and 22PPG while shooting almost 49% against them earlier this year. In the Chicago series, Wade posted an ADS+ of 8.1, but only 19PPG and 40.5% shooting from the field. With the low ADS+, you would expect the PPG and FG% numbers to be a bit higher. For whatever reason the Bulls gave him trouble overall and Dallas is defensively built like the Bulls at this stage in the game. The one thing Chicago did not have was the offensive firepower to capitalize on a slow night from Dwayne Wade, something the Mavs have deep into their bench. James and Wade combine for exactly 50% of the Heats FG-A's per game. It would be almost silly to think you could slow down or even stop both of them on any given night. If Dallas has to pick one, as of right now, it would have to be Wade. LeBron's ADS/ADS+ in the Chicago series was 13.7/12.2 as compared to Wade's 9.1/8.1, 4.6ft further away per shot. Even with this being the case, LeBron has had a better FG%, PPG avg, and been able to get to the FT line at a higher rate. Neither of them shot long range jumpers (16ft-23ft) extremely well in the Chicago series, though James (39%) was much more efficient than Wade (26%). Against Philly and Boston, Wade shot a combined 50% and James was about the same at 41%. Would you kick a peg legged pirate in his good leg to make him fall down? The three main contributors for Dallas will play a big role defensively for Dallas trying to slow down LeBron James and Dwayne Wade in this series. While Terry, Marion, and Kidd have managed to come up with timely steals and defensive efforts, their offensive contributions throughout the playoffs have paid dividends as well. The 2,3,4 scorers (respectively) in PPG behind Dirk have not failed to have their moments with a combined ADS+ of 13.3 throughout the playoffs. Terry has been the main scoring threat next to Dirk for most of the regular season and playoffs. While the Mavs willl need Jason Terry waiting in the wings to connect on some three pointers, they will also need him to be creating shots close to the basket. The Mavericks are better when JET averaged an ADS+ under 14. Restating the Mavs records when this happens, they were 15-5 in the regular season (4 of those losses were when Dirk was injured) and 5-1 in the post season. Terry will always be available for the timely three, but if he and Marion attack the paint it will help keep Miami's defense spread out and honest. 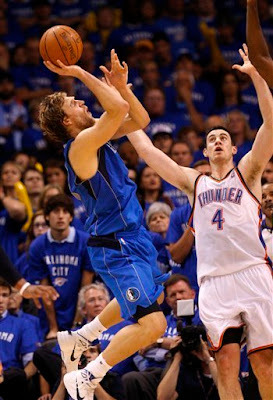 This will in turn help our German stay ri-Dirk-ulously on fire in another playoff series. This is a very easy matchup to analyze. Do not let LeBron and Dwayne Wade go off at the same time, attacking the rim, and getting easy baskets and FT opportunities. This is easier said than done, but it wont be something the Mavs are unable achieve if they continue their current brand of post season basketball. It is hard to put into words how epically unbelievable Dirk has been playing in the playoffs. Any article or column describing his game should be replaced with a YouTube video because only the eyes could confirm its real. Nowitzki finished off the Thunder with an ADS+ of 9.5 and 32.2 PPG while shooting nearly 56% and 97% from the FT line. He has become a malcontent and aggressor on offensive by refusing to settle long distance shots and creating FT opportunities. To put it in perspective, last series against OKC, Dirk averaged 12.2 FT-A's per game doubling his season average of 6.1 FT-A's per game. When his regular season ADS/ADS+ of 14.3/13.1 is compared to his playoff ADS/ADS+ of 11.2/9.5, he is averaging over 3ft closer to the basket per shot in the post season. The stats will back up the eyeball test telling you that Dirk Nowitzki is a man on a mission refusing to settle in this playoff run. Its easy to emphasize the importance of Dallas' MVP. Chris Bosh had a remarkable turn around in the post season since he insinuated that the moment might be too big for him. Maybe he finally found a match up he liked against Carlos Boozer or maybe he figured out the big stage. Either way Chris Bosh is now a piece of the puzzle Dallas must figure out how to stop. While his playoff ADS/ADS+ numbers are a nice 10.4/9.0 ratio, it is worth noting against Dallas this season his numbers were much higher sitting at an ADS/ADS+ of 14.9/13.4, around a 4.5ft difference. This is something numbers would indicate is not a coincidence or fluke given the amount of shots he took comapred to his counterparts (Bosh-35FGA, LeBron-36FGA, and Wade 33 FGA). The matchup with Bosh is similar to the Mavs first round matchup with LaMarcus Aldridge, which is a good thing come playoff time. In the regular season Aldridge averaged 27.8PPG on 51.7% shooting against Dallas. However, the Dallas defense (mostly consisting of Chandler and Haywood) turned up the defense in the playoffs lowering Aldridge's numbers to 19.6PPG on 43.2% shooting in the series. Aldridge and Bosh are similar players and will probably be defended in a similar manner by Dallas. Dallas, once again, will lean on its luxury of having two lengthy and quality 7 footers to slow down a mid range shooting power forward. Tyson Chandler should see majority of his defensive minutes trying to eliminate Bosh from the Miami equation. As big as an importance Chandler's defense is for Dallas, any offensive prowess from Tyson in the finals will go along way as well. During the regular season against the Heat, Chandler had an ADS+ of 2.9 and 11PPG while shooting 69.2% from the field. If he can duplicate these contributions in the Finals, it would be such a sweet bonus for Dallas. The Heat lack true depth at the Center position and any aggressiveness on Chandler's part could lead to foul trouble for Joel Anthony. Anthony is not any type of offensive threat, but he is a reliable defender and has averaged 2.1 blocks throughout the playoffs. Beyond him are players with skill sets Dallas would very much like to see in there defending the paint and the players who enter it. Anthony should be an after thought when game planning for Miami, but perhaps attacking him could be the first domino to fall. The Miami Heat bench is very thin, even with the recent inserting of Udonis Haslem back into the rotation. The combination of Chalmers and Miller are basically relegated to the 3pt line, with Chalmers having a little versatility but nothing too threatening. Combining for a mere 12.1 PPG throughout the playoffs, the Miami bench brings very little to the aid of their superstars. The Dallas bench is the complete opposite in that aspect of the game. When your bench has a player your opposition is claiming to prepare for in a similar manner as they did a NBA MVP, you're in very good shape (even if that statement is an embellishment). JJ Barea provides a jolt for Dallas at times when they need it most. Barea has posted an ADS+ of 10.3 and 8.9PPG in a variety of ways including knocking down 3's, driving to the hoop, and getting opportunities at the FT line. He has averaged just over 11PPG the last two series for Dallas and they will need him to duplicate that in the finals. Peja Stojakovic did not have a good series against the Thunder and the Mavericks will need the Serbian sniper to snap out of his current "slump". If he gets hot like he did in the Lakers series, then great things happen for the Mavericks. Peja will continue to get a lot of looks from 3pt land when defenses converge in the paint. If he is draining his shots that will create one huge headache for Miami not even a Bloody Mary could cure. The Heat's trio of James, Wade, and Bosh combine for nearly 70% of the Heat's FG-A's per game, nearly 16% more than the Mavericks top 3 in FG-A's per game. The Heat trio also combined for an ADS/ADS+ of 11.3/9.8 for the entire playoffs while shooting 47% from the field. Dallas will not be able to shut down all three of the guys on any given night unless they play with 9 men on the floor, which is against the rules. The key to success is going to be to try to completely take one of them out of the game. Given the matchups and weapons that Dallas has available to utilize, Chris Bosh will probably be the best bet in that aspect. In games he had 25+ points, Miami was 10-2 on the season. Dallas must also try to keep pace in the FT-A department. Free Throws are free points for Dallas and the way LeBron and Wade attack the rim will almost ensure Miami will have a plethora of them. A free throw is typically the highest percentage shot on the floor for most players, even compared to a dunk or layup. More FT's mean a lower ADS+ and a lower ADS+ usually spells success for Dallas. Dallas does not have any shortage of offensive weapons either. Terry, Marion, Kidd, Chandler, Barea, and Stojakovic can all take over at any point or stretch in the game. We've seen them do it constantly this postseason With the determination the Mavericks have embodied, there is little reason to believe the trend doesn't continue. And If Dirk continues his practically robotic terminator style of cold blooded dominance over his opponent, Dallas could easily be heading for storied ending that began with a tatoo of confidence back in October. Except this ending would be David Stern handing the Larry O'Brien Championship trophy to Dirk and uttering one relieving phrase -"Take Dat Wit Chew." Perhaps this is a change-up from your 2011 NBA FInals reading, or perhaps you will decide to skip this altogether because rehashing a painful defeat can be a wonderful way to kill your buzz. What you are about to read could perhaps be labeled "The Diary of a Madman". I don't know what makes me do some of the things I do with my sports-obsessed life, but I must follow my instincts and do what feels right at the moment. And for reasons that I cannot quite explain, my mind told me that this weekend I must face one of my demons. Some people think I am nuts when it comes to my sports. I am an admitted sports-nerd and sports-addict. I have no issues with gambling to report; I am simply just a person who cannot imagine anything more exciting to follow than athletics. I am lucky enough to consider my job and my hobby exactly the same thing. I don't have many vices as a human being, and frankly, not too many hobbies that aren't somehow related to sports. So, while I love the human dramas that make up our "sports world", I also fall victim to becoming a bit emotionally involved at times. There are some sporting events that I can watch with almost no emotion. But, there are others that leave a scar. 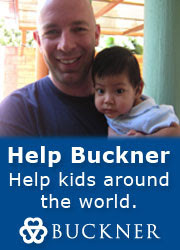 I felt you needed to know all of this because of what this project today is all about. Over the weekend, I did something I did not ever want to do again. There is a vault in the back of my mind with a few sporting moments in my life that I have locked up and - although I acknowledge that they happened - I never want to revisit them again. Going back would be too painful and too damaging. I lived them once live, and that was plenty. At some point, I accepted the defeat as a result that I could do nothing about, so I filed them away and tried to forget as much as I could. The 2006 NBA Finals is one of those few events that I have avoided for the last 1800 days. 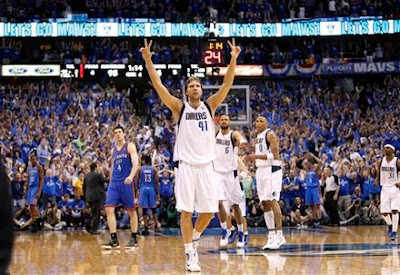 I considered the 2006 Playoff run of the Dallas Mavericks to be one of the most magical 2 months of sport in my life, but then I consider the 8 days from Game 3 to Game 6 some of the most depressing days of sport I can imagine. The next week was very bleak. I did not want to accept that it was over. I did not want to consider that Dirk and the rest of my guys were never going to get to the prize. They were so close. Everything was so perfect. And then it crashed. Very few franchises in sports would consider their greatest moment and darkest moment to be basically the same story. But, I would submit the 2006 Dallas Mavericks would be both. Your memory is a weird tool. It helps you remember things perfectly from your childhood, but it also allows things from this morning to vanish into thin air. It helps you recall your first kiss or your best high school game in perfect clarity, and yet, you forget what your wife told you to buy on your way home from work. After Thursday night, when Chicago fell in 5 games to Miami to insure that the 2011 NBA Finals would match the two teams from the 2006 NBA Finals, I decided that I needed to allow that dark place in my head to have a little time out of its cage over the weekend. I would attempt to watch as much of Games 3-6 as I could find on Youtube (and just about all of it is on Youtube if you, too, consider yourself a masochist). It was not enjoyable. However, I will concede that since I knew ahead of time that things were not going to finish well in any of the games, that my head did not ache nearly as much and I was able to get a relatively good night's sleep both nights. I really hope you had a chance to read Eddie Sefko's piece in Sunday's paper about this very topic. He did it in a far more professional manner, and he also fills in the gaps quite a bit. My review is a more to focus on two things - composure and strategy. In my memory, and from what I hear and read from many of you, too, the series was won because of A) Dwyane Wade and B) Bennett Salvatore. The further we get from the series the more the popular idea is that the Mavericks had the series taken from them and it was a gross injustice by the NBA and their officials. I accepted it as some level of fact, but I also do not like to blame refs for things that your team does not properly execute and accomplish. But, over the weekend, I watched the game from a stand point of "How did the Mavericks handle things?" and "How did they counter what Miami was doing?" In both cases, I was very shocked and disappointed with what I saw. Because at every turn, I kept coming back to the feeling that the Mavericks lost their heads. Adversity and uncontrollable circumstances come at you constantly in professional sports. In the NBA playoffs, there are so many momentum swings during the course of a game and a series that you really cannot allow your head to hang and to become your own worst enemy. But, watching the film of the '06 Finals reveal to me that the Mavericks were mostly brought down by their own lack of composure. The evidence is almost everywhere. They dominated both of the first 2 games. In Game 2, the Mavs held a 24 point lead entering the 4th Quarter. The Heat were beaten and as this series headed to Miami, the Mavericks needed to only get 1 game in Florida to set things up to where they only needed 1 win in 2 games in Dallas to win the NBA Title. In Game 3, that fateful day where the Mavericks held a 89-76 lead with 6:15 to play, the plane began to dive. They held a 10 point lead at the 5-minute mark. And, after that scored 1 basket the rest of the way. My memory indicated that the Mavericks started settling for perimeter shots. But, in watching it with a critical eye on Saturday, I actually came to 2 conclusions. 1) Dallas began to try to milk the clock. This is a dangerous game where you don't begin your attack until the shot-clock is well under :10. When you do this, you risk not getting a good shot. You must take whatever is available when the shot-clock nears zero. and 2) Dallas just stopped hitting their tough shots. Let's face it. Especially in 2006, the Mavericks offense was very difficult to stop because Dirk and Jason Terry were so successful at making tough shots. They seldom were able to get what we consider "easy looks" by NBA standards. But, they could always make tough shots. And this was one of those cases where they were able to get shots they normally hit, but they went cold at just the wrong moment. As the time started clicking away and the lead shrunk, things started falling into place. Shaquille O'Neal was hit two very important free throws after hitting 2 for 16 in the first two games of the series. Gary Payton, who my memory had given very little credit for his ring, hit the biggest shot in Game 3. With the score tied at 95-95, the game clock was down to :10 and the shot-clock at :01 when he stepped up and nailed a huge 21-footer. It was his only shot of the game! Meanwhile, Dirk Nowitzki went strong to the rim and was fouled with :03 and barely missed the basket and the foul. He had made 25-26 free throws in the NBA Finals to that point, but missed the 2nd free throw that would have tied the game. This confluence of events (Shaq making his free throws, Dirk missing his) was amazing on so many levels. With :01 to play, the Mavericks had one last chance with the ball on the side and down 98-96. In a very curious coaching decision, the Mavericks made sure that Dirk would not take the last shot because Avery decided he should be the man to inbound the ball. Words could not describe how insane that seemed to take one of your only shotmakers out of the equation - especially since he would be the easiest to find since he is 7-feet tall. Instead, a lob pass to Josh Howard which never had a chance sailed wide and the Mavericks lost a game they never should have lost. Instead of a 3-0 lead, they were hit in the head with a heavy punch. But, still; they came to Miami to win at least 1 game. Losing the first one should not have derailed the entire train. But, oh, how it did. As I compare the 2011 Mavericks to the 2006 Mavericks, all I can think of is the composure that I see on this team and the lack of composure and maturity that those Mavs had. Their owner, Mark Cuban, routinely had the media at his disposal during those Finals and seemed intent on poking the refs as often as possible with sharp sticks. Avery Johnson seemed to make one coaching error after another. On the roster, there were very few calm veteran personalities. Dirk was Dirk, but around him at crunch time were the very young Devin Harris, the always unpredictable and young Josh Howard, veteran Erick Dampier - a player who had almost no role in crunch time yet he played plenty of minutes, and two vets who both had moments of lost composure - Jason Terry who was ejected and suspended in the Spurs series for his punch to Michael Finley's groin and Jerry Stackhouse who was ejected and suspended in Game 4 of the finals for a brain dead tackle of Shaquille O'Neal. If there was one Jason Kidd or one Rick Carlisle or one Tyson Chandler on that team (even an older version of Dirk), maybe they shake off the Game 3 disaster. But, this group took a small problem and made it worse and worse. One game grew into four and the Finals, which require supreme composure and nerve control, showed that Dallas had none in reserve. The video tells the story. They missed so many big shots. 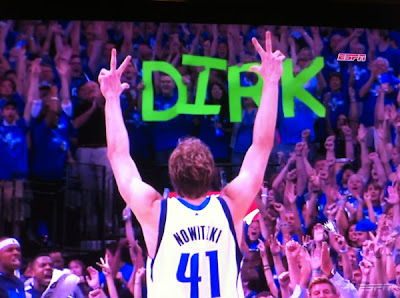 They missed free throws at just the wrong time (Dirk did it in Game 3 and again in Game 5). They lost their temper. And most of all, their two authority figures - Avery and Cuban - lost their minds in front of the media. Game 4 showed nothing from a Dallas perspective except that they were now damaged. They set the NBA record for least points in a quarter with 7 points in the 4th. They also lost arguably their most veteran presence when Stackhouse lost his mind on O'Neal with the team down 17 points. A 98-74 decision squared the series at 2-2. Again, at any point, the team could have regained their composure if they had proper leadership. Either on the roster or in management, the right voice could have saved the season. Avery Johnson, like Dirk and Cuban, seemed to show that this stage was a bit more intense than he thought it would be. He challenged the team in the media by saying maybe they aren't getting mad enough to stop Wade. He blamed their night life and vacation-type attitude on South Beach for the state of affairs on the court. He made the team leave the Mavericks entourage and switched hotels to Fort Lauderdale. The team had players room together to attempt to get everyone to band together. If the Mavericks had pulled out the Finals, perhaps the hotel stunt would go into lore as the reason the season was saved. But, given how Game 5 turned out, it looked like another mis-step by a coach who was not finding the answers to keep his ship from sinking. I remember the Avery Johnson era rather fondly. In my memory, he was the coach who taught the Mavericks that defense wins championships and that emotion is your friend in the playoffs. He was able to reach players better than Don Nelson and challenge their fight and desire for success. But, the 2006 Finals demonstrate a coaching mismatch that may have decided the series. Being on a list of guys who have been out-coached by Pat Riley is not a very short list. But, I think in viewing the "Meltdown in Miami" over the weekend, I received a much sharper image of how badly the coaching difference truly was. Riley dominated Avery. Some of it was based on Riley's strategies but some of it was back to Avery not thinking clearly. Avery is calling the "Hack-a-Shaq" repeatedly when the Heat were not in the bonus. He even ordered it when DeSagana Diop had 5 fouls and had to disqualify himself to do so. He signaled a timeout to his team (that he wanted taken after the next free throw) and since they couldn't hear what he was saying, they called the timeout. Player error in truth, but a coaching error because of poor communication. There were moments of single-teaming Wade and quadruple-teaming Wade. Game 5 was a game that could and should have been won by Dallas. But, lack of composure from team and coach proved to be their undoing when I watched it again on Sunday. And then, after Game 5, Avery and Cuban both blew their stacks again in front of the media. Dirk was being swarmed by the Heat and despite making some huge shots, must have felt by himself. Stackhouse, the de facto leader, was in street clothes due to his suspension. Howard and Harris were not ready to be on the floor in big moments like Gary Payton was ready for. Howard missed 2 gigantic free throws in overtime that would have likely been enough to win it. And, of course, the fouls called that sent Wade to the line again and again. And with each passing whistle, the more the Mavericks let it into their head. The pressure built. And pressure, as they say, bursts pipes. Game 6 was the completion of a death that was put in motion back in Game 3. By that point, Antoine Walker and Alonzo Mourning were giving them fits. Jason Terry couldn't hit a shot to save his life in Game 6, and yet he is the one who took the shot to save the season at the end. And it missed. The Mavericks lost the 2006 NBA Finals largely because they were not composed and mentally strong enough. After watching the unraveling again, I am sure that this is more important than Wade or Salvatore. Had Dirk, or Avery, or Cuban, or Stackhouse, or anyone been able to take a deep breath and calm the troops, assure them that things are fine, and design a plan to retake the series by the scruff of the neck, things might have been different. Surely, one gut punch should not set a team that was playing so well into a reeling state that it cannot recover from. But, alas. My eyes tell me that the collapse in Game 3 set of a chain of events that were never stopped. The chance at basketball immortality had vanished. Perhaps, forever, for many players, coaches, and a certain owner. There were a number of strategy issues which we could elaborate on that just didn't make sense. However, more and more, I keep coming back to the idea that the lights were too bright and the tempers were too short. In a way, much of what dismantled Oklahoma City in the last round in 2011 is what took down the Mavericks. They just weren't ready. And that is what gives me some hope in 2011. This Mavericks crew learned from that one. Cuban is almost in hiding rather than angering the league officials at every opportunity. Dirk looks so much tougher and more refined between the ears. And the rest of the cast is made up of steely veterans who have seen every situation and now unify for one purpose. I don't see their coach having to chase them off South Beach. In 2006, I believe that lack of composure was the single biggest issue. They just didn't deal with adversity at all. It changed their ability to function; To play through bad calls; To hit shots and free throws that they normally hit. And for that, they did not deserve to be champs. As much as it hurts, when I look back it pains me to admit that the biggest culprit to the Mavericks' disaster was the Mavs themselves. Tomorrow, I would like to take items from the 2006 team and compare them to the 2011 team to see what can be learned. - OKC turned the ball over 7 times in the 4th, more than they had the first three quarters. - Durant and Westbrook combined for a total of 54 points, the rest of the starters had a combine total of 2. - Dirk and Terry are the only remaining players from the '06 team that could have a rematch versus Miami. Click here to read Bob's Morning After for Game 5. Because thats what friends do. Thanks to Adam Rosen for the data. Check back to read his ADS preview for the next round. If sports fairy tales came true, then that would mean that we would be assured a happy ending in the Dirk Nowitzki trip around the basketball world in a few weeks' time. In the same category in the fairy tale section as the John Elway Super Bowl victory, everybody had assumed the window had shut on his chance. His greatness as a whole had been pushed down a spot or two when discussions were had after playoff disappointments. Surely, he was not of "championship quality". Surely, he is to blame for his team falling short in the playoffs. In a star-driven sport, the Dallas Mavericks have a real nice player, but not one of those great ones that win trophies. We don't know how this sports story will end when basketball season is over. But, we know about last night's chapter. The one where the team was down almost 47 minutes into a 48 minute game. The Mavericks were trailing 94-92 with 90 seconds to play when they reacquired the ball on a steal by Dirk. Russell Westbrook thought he saw an open Nick Collison down low, but Dirk stepped in the path of the ball and was able to get his right hand on the pass and the Mavericks had the ball back. Inbounds play with 1:24. Jason Kidd will pass it in as all 4 Mavericks start the play at the free throw line. As Kidd looks for options, first Terry and then Tyson Chandler screen Collison as Dirk drops back behind the 3-point line. Because of the double screen, Dirk is free for a split second. Kidd puts the ball in the German's hands and the arena gasps with excitement as the shot leaves his hands and a swish is forthcoming. But, it doesn't go in. It rims out. And Westbrook grabs the carom as he battles Chandler down low. But, in the scramble, Westbrook loses his balance and as he is falling to the ground (with Chandler's foot helping to knock him over) he tosses the ball back in play and what he hopes is to his teammates. However, in another stroke of fortune, he basically rolls the ball to Jason Terry. Terry goes cross court to Marion. At the point Terry gets the ball, Dirk had already dropped back on defense and was actually on the time-line. He reversed his direction back into the front-court. On the next possession, the Mavericks buckled down hard on defense and forced an airball from Eric Maynor from the paint and Nick Collison collected the rebound as he was falling out of bounds. With no other option, he also attempted to send the ball in the general direction of his teammates and hope for the best. And like Westbrook's attempted blind pass, the results for the Thunder were not what they had hoped. Like so many moments in this series, when the Mavericks needed a 50/50 play to go their way, it did. Terry and James Harden both leaped for the ball and somehow it tipped over to Shawn Marion - a player that always seems ready to go get the loose ball when they are needed the most. Marion had nothing but open court ahead of him and was about to make a 1-point lead bigger. As he is heading down the court with 52 seconds to play, you can see Durant trying to chase him down. For a split second, Jason Terry pulls another veteran move and blocks Durant's path for a step. This gives Marion all the space he needs and not only does he get the dunk, but he also is fouled as Durant still tried a desperation block that was called for contact. The place again explodes. The end is near. But, Dallas knows that they have an urgency that the others don't have. They know that their window is open right now. In a few weeks, it may slam shut for them forever. Many of these players know that they have been in thousands of practices and flights and hotels and games and the only thing they are missing is the right to be NBA Champions. And how was that best demonstrated last night? You could certainly argue the game's final moments. But, I prefer to dwell on the Western Conference trophy presentation. Sure, there were a few moments of jubilation allowed as Dirk showed the trophy to the fans. He was done with this moment. He was happy, but he wasn't interested in giving anyone the impression that his mission was accomplished. He was ready to move on. And he wasn't even going to wait for his coach to end his interview with ESPN. Instead, he left. And his teammates didn't need anyone to instruct them what to do. They do what they have done this entire playoff. They followed their leader. In moments, the entire team had exited the stage. Even though they have days before they engage in the final battle of the war, they were heading back to the room to symbolically move on, too. It was a moment in time that will not be forgotten. It was the moment that best demonstrates how much Dirk has changed over the years. The unassuming fellow who just loves the sport has grown into the leader who is driven by victory and for the moment to personally vanquish his enemies. He has grown into that William Wallace figure that his detractors said he could never be. "We talked about it after the game. This is a great moment and we can enjoy it for a day. But, we got one of those trophies already and it didn't mean anything at the end. I think once you get to the Finals, there is no 2nd place finish. I was already thinking about the Finals. I'm going to stay in the moment, obviously. Like I said, this is nice for a day, but we said our goal in October was to win it all so we haven't done that yet." 2010 Draft Profile From OurLads.com: Akwasi Owusu-Ansah - 6'0 - 207 - 4.44 (40) Three-year starter. Small college athlete that has good speed and talent. A big corner that is durable and was productive over his college career. Long legs prohibit him from keeping low in his backpedal. Average hip flexibility and loose hips for a smooth turn and burst. Needs to learn various techniques required by a defensive back. A developmental size and speed prospect. Could run with any receiver that he faced in college. Not naturally instinctive to run or pass. Will need repetition in zone coverage. Will need to get accustomed to tackling bigger and faster ball carriers. Has ability, but needs work. In his career he had 73 tackles, 19 passes broken up, and 10 interceptions. Fourth/Fifth Round. 2010: The book on AOA is still entirely unwritten. He was drafted with a shoulder injury that kept him out of off-season work until training camp began in San Antonio in late July. At that point, he was attempting to learn a position he had never played at a level of football well beyond what he was accustomed to at Indiana of PA. 28 players took a defensive snap in a regular season game for the Cowboys in 2010, and Owusu-Ansah was not one of them. He did show some very interesting tools and potential in the 2010 preseason and the interest level was high entering the season. But, when he returned kicks in the first 7 games, despite having speed that suggested he would be a very dangerous return man, the reality was that he was about as average a returner as you could have. Appearing to lack the vision to find the crease, the Cowboys saw a dramatic improvement in the return game when he was lost for the season and replaced by Bryan McCann. He was placed on injured reserve after the Jacksonville game, even though it was believed he could have returned if the team was in a better position to compete in 2010. 2011 Analysis: Drafted as a player the Cowboys thought could be a conversion player to free safety after playing cornerback in college, there is certainly a fair investment riding on his development. The beauty if this pays off is that he could play either corner or safety in a pinch. But, obviously, he has to do one of those well enough at a NFL level to justify the roster spot. It should be noted that in the 2009 draft, the Cowboys also thought they could convert their 5th round corner, DeAngelo Smith from Cincinnati, to safety and he was subsequently released out of training camp. He is a player that could use all of the work he can get has missed the 2010 off-season with injury and the 2011 off-season with the lockout. 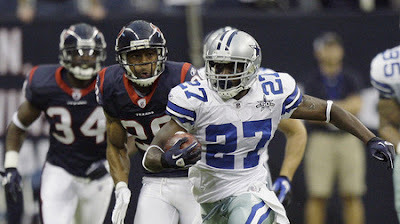 It is believed that the Cowboys were getting a solution to their kick return options as well, but after he lacked any sort of explosion in almost a half-season of work in that department, now he seems to be a ways down the chart of ideal return men in 2011. Perhaps the Cowboys are trying to tell us something when they largely ignored the position in the draft, but we can only speculate about that until we see who is manning the position when they get to training camp. Surely, the idea of Owusu-Ansah playing a significant role is still a ways down to road, and they are in the market for one of the starting free safeties around the league who will be available in free agency. There are questions about AOA's instincts and his willingness to tackle, and until those are both answered, we should not count on much in the present tense from this project on the Cowboys' roster. I would not surrender hope for his future - although with 53 man rosters, the NFL does not have much time or space for long-term projects. He will need to show the Cowboys some promise quickly, or they might consider moving along already. Dirk Nowitzki has been dazzling in these playoffs in so many ways. Many of us would suggest that this is the best version of Nowitzki that many of us have ever seen, and that says something pretty substantial. We often talk about how playoff basketball is different than the regular season, but what does that mean? Well, it means about 1,000 different things, but for a great scorer, it could mean that in games of great importance - against defenders who are far more determined and prepared (imagine the amount of preparation that goes into defending Dirk over a 7-game series versus a Tuesday in February) to deal with you. Also, will that great scorer be even more determined and possessed to get better and better shots. To draw contact and get fouled and to make sure that the defenders are not dictating his game - rather, he is. 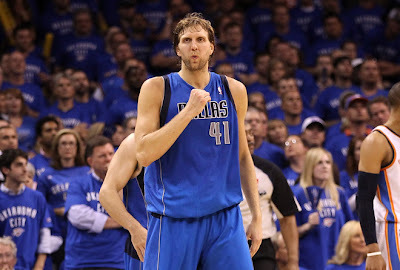 Dirk, in the 2011 Playoffs, has been a very determined scorer who at many different times, would not be denied. That shows the average Dirk shot has been from 14+ feet away from the basket. He is an amazing shooter, so obviously this is not a bad thing, but almost 1200 shots and he was over 14 feet away. In the playoffs, he has taken 256 shots in 14 games. This averages out to 18.3 FGA per game and 9.4 FTA per game. In those game, his ADS has dropped through the floor down to 11.5 and his ADS+ is under 10 at 9.7 per attempt in the Western Finals. The Portland series showed us that Dirk was not going to settle. In Game 5 in particular, he was not going to allow Portland to push him out to the perimeter after a Game 4 where he was dagger hunting from behind the stripe and it bit the entire team. His Game 6 was also fabulous by ADS standards. A very good start. The Lakers had the defenders to deal with Dirk in the post over the course of the game. But, at crunch time, he still did some very heavy lifting although his averages are much higher in this series. I think you would look at the higher numbers in the Lakers series (although still lower than his regular season numbers) as "fishing where the fish are". He knew what the Lakers could handle and what they had no answer for and adjusted accordingly. Then, in this Oklahoma City Western Conference Final, we are seeing some of his best work yet. His Game 2 - which some suggest he waited too long to take over - was unreal from an ADS standpoint because when he went to work in the 4th Quarter, it all ended up near the rim. Nick Collison does offer some resistance, but we see here that the Thunder do concede Dirk's ability to get shots wherever he wishes on the court. There are different levels of "unguardable" and with the Thunder, we have seen Dirk in the baseline post, high post, wing, and various other spots to counter what Scotty Brooks and the Thunder are trying to throw at him. We can debate what the ADS numbers actually tell us when we compare team versus team and player versus player. There are certainly a number of variables that cannot be accounted for as is the case with almost all of the statistics in sports. But, I don't think there is much dispute that when used to compare a player against himself, it has very practical measurements about what kind of shot a player is capable of getting and what kind of shot he is getting today. Dirk, who took 14 footers all season, is getting a full 2-feet closer on each shot in the playoffs. That is not a number that should be ignored. Well, if you had to pick a single game to make a case that the last five minutes are the only thing that matters in an NBA game. Last night was that game. Though I would make tell you that last nights game was worthy of your full attention, you really got a 2 for 1 if you did watch it all. At the start you had the young speed and talent of OKC and the age creep up on the Mavs that everyone has been so worried about. Then in the fourth you could make an argument that it was either veteran leadership of Dallas that won it or the inexperience of the Thunder that lost it. OKC's ADS nearly doubled as we take a look at the game break down. I know we all love numbers, so thanks once again to Adam's hard work we have a new aspect that ADS allows to to view. We keep preaching that the lower the ADS the better, well obviously that isn't always the case because if Stojakovic is making it rain you don't want to fix whats not broke. But if Durant wants to keep jacking up threes in the fourth after giving up a 15 point lead he may want to think about whats been working for him. Here is a breakdown of Durant, Westbrook and Nowitzki's ADS of made and misses. From beyond 3ft, Durant is 26/69 (37.7%) and Westbrook is 13/48 (27.1%) for the series. Click here to read Bob's Morning After for Game 4. Because if you don't, the Communist win. Thanks to Adam Rosen and Heath Huston for the data. A 15-point lead with 4:49 left to play. A 10-point lead with 2:23 left to play. What followed was some of the most unexplainable, historic, and chaotic basketball most have ever witnessed. Years from now, this was the type of game that those who weren't at the arena will claim they were and those who went to sleep when the lead was 15 will always deny it. This was the win that you had to see to believe. And really, it still is not easy to comprehend. You can watch 1,000 NBA Games and never see that. The Dallas Mavericks did something so unlikely in Game 4 in Oklahoma City after a night of such disappointing results, that one can easily summarize the moments late last night under the heading of, "It might just be their year". Because, let look for another explanation. They were annihilated in rebounding by a 55-33 margin. In fact, with 5 minutes to go in regulation, I offered the following observations via Twitter from the arena: "Mavs being outboarded 45-21. And outscored in the paint 54-34. Very weak effort all in all." The Mavericks spent most of the evening allowing the Thunder to get some pretty easy points. There were 2 inbounds plays early in the game where the Mavericks had the ball stolen on the inbounds pass and converted into dunks immediately. They looked a step slow in both body and mind for almost the entire game. Admirably, the Mavericks stuck around in through the storm early. The Thunder wanted to blow them out of the building in the 1st Half - and almost did. They hit their first 9 field goal attempts and Kevin Durant in particular appeared to be a man on a mission after a disappointing Game 3. He started the game in a mode that made him quite unguard-able. The lead was pushed to a dozen on many occasions in that 1st Half, but the Mavericks would hit a shot and keep hanging around. At the half, the lead was merely 5 points, 59-54, and you could feel the entire arena grow a bit uneasy with that. After what seemed to be a dominating 24 minutes of basketball, the lead sat only at 5? What more could they throw at Dallas? The 3rd Quarter was the Jason Terry show. He hit many important shots and the Mavericks actually were able to trim the lead all the way down to 2 late in the 3rd Quarter, 79-77 when Brendan Haywood put back a missed shot. The Quarter ended 81-77, and the Mavericks were still in a game in which they were having all sorts of trouble. For instance, they were not being out-rebounded slightly. They were being dominated. In the 1st Half, the Thunder had grabbed 19 of the games 30 rebounds. A 19-11 split is quite impressive from the Oklahoma City standpoint, and thoroughly disappointing from a Dallas standpoint. The 3rd Quarter continued on the trend. In that period, the Thunder secured 14 of the 21 possible rebounds. For the game, the rebounding edge was now an insane 33-18. It was almost as if the Mavericks were not even making an effort. As a reference, depending on who you ask, most coaches will tell you that the defensive team should secure about 70-75% of all rebounds on their end of the court, given their inside positioning and advantages that defense supplies. Well, through 3 Quarters, on defense, the Mavs had secured only 52% of defensive rebounds. They were leaking all over the court as Nick Collison, Serge Ibaka, and Russell Westbrook repeatedly pulled out offensive glass for the Thunder. Meanwhile, on offense, it was even worse. 4 of a possible 24 rebounds went to Dallas for 16%. They just didn't look up for the fight. Again, they weren't being beaten. They were being run off the court in the areas where desire and effort are best measured. Points in the paint and rebounding were all going the Thunder's way. They weren't trying to win this game, they were taking this game. But, the 4th Quarter is where the Mavericks played some of their worst basketball of the night. They started the quarter just down 4 and were very much in the game. But, for the next 7 minutes, nobody would score but JJ Barea. That was most likely because nobody was making an effort to get close to the hoop other than Barea. He scored from 5, 2, and 6 feet in those 7 minutes as he was putting up 7 points. Otherwise, Terry launched 2 shots from 25 feet, Kidd took a long 3, and Barea tried one, too. They all missed. Dirk took a couple jumpers from about 18 feet. Those both missed. No jump shots were falling. At all. Meanwhile, Serge Ibaka and Kevin Durant were causing havoc on the other end of the court. In one sequence with about 8 minutes to play, Ibaka rejected a Nowitzki shot, ran to the other end, rebounded a Durant miss, put it back up - missed again, rebounded again, and finally converted. The Thunder just wanted it more. Then the sequence where many in attendance and around the country watching on television misidentified as the "dagger"; With just over 5 minutes left, Westbrook missed a 3 pointer, only to have Nick Collison get yet another offensive rebound and fire it out to Durant who purely sank a majestic 3. The arena went absolutely bonkers and the Mavericks with shoulders slumped wandered to the bench for yet another timeout. 99-84. 5:06 left and this game is over. We will never know how many people clicked the game off at this juncture. And who could blame them? There is no such thing as a blown 15-point lead with 5 minutes to play. It is simply next-to-impossible to pull off. We also won't know what Rick Carlisle told his team there. He substituted Shawn Marion for JJ Barea, which appeared slightly dubious since nobody had scored in the 4th besides Barea, but down 15 points, he tried something different. And, this is why we love sports. This is why we tune in. Because sometimes, when you least expect it - and against all odds - the impossible happens. In the last 15 years, no team has blown a 15-point lead with 5 minutes to play in a playoff game. The pace with which a collapse would have to take place makes it nearly impossible. Before this series started, a few basketball wise men indicated to me what we were all thinking: Chances are, at some point of this series, when a game is close and time is running out - OKC will reveal itself as a very young team that is not quite prepared for the moment. When they were so flawless in Game 2, I recalled that discussion, and was quite impressed with the composure of the Thunder and their lack of fear for the moment. But, in these last two games, in front of an adoring crowd that clearly unites as one voice, the ultra-talented crew from Oklahoma City has not quite kept composure in the final moments. And this is where they left the door cracked just a bit. Dallas chipped away at the lead with a number of free throws - one foul which disqualified James Harden for the remainder of the game. That would impact the options for OKC on offense for sure. Dirk hit his first FG of the quarter with 3:15 to play on a shot that cut it to 99-91 with plenty of time left, but after yet another Collison offensive rebound, Westbrook hit a free-throw line jumper and the lead was 10 points with just 150 seconds to play. The Thunder still were comfortable. And that is when amazing started to happen. Dirk stepped into and fired a straight on 3-pointer right over Collison with 2:22 left. 101-94. 11 seconds later, Westbrook missed both of his free throws - a highly unlikely scenario for a 84% free throw shooter. Marion gets the rebound and moments later Dirk might have hit one of the signature shots of his career. I think you could best describe it as a well-guarded, fade away, double-pump shot in which he was hit pretty hard. No call, but also no rim. And the lead was just 5, 101-96. With 1:38 left, Westbrook misses a 15-footer, and down the other way comes Dirk again. Now, fully in "beast mode", Dirk wants the ball up high in the lane, and after a few twists, puts another right over Collison and right through the hoop. 101-98, and the arena tension is easily detectable. Just over a minute left, and what looked like the opportunity of the night slipped through Dallas' fingers. Shawn Marion, after another night of hounding Durant as well as can be expected, helped steal the ball and was open for a pass on the fast break. However, Jason Terry elected to take it himself, but a great recovery by Thabo Sefolosha with a block and rebound kept the lead at 3. Now, Oklahoma City has the ball and the 3-point lead with 40 seconds to play. But, Westbrook - who does not fear taking the big shot - misses another jumper and Dallas is back in business because Westbrook then immediately fouls Marion and the Mavs get another point without the clock ticking. In those final 5 minutes, the Thunder took 9 shots and hit just 1. Had they hit 2 of 9, they win the game. But, after a miss from the corner by Sefolosha, Dirk is fouled on the other end when Collison grabs him around the waist on a pick and roll. Dirk hits both free throws and the game is tied - and Nowitzki had scored 12 in the 4th Quarter and 38 in regulation. One last possession from the Thunder in regulation - and there is Marion again on Durant. First, he forces Durant to catch the pass out near the time line. Then, he actually challenges a deep 3 by blocking it at the apex of the shot. This is a very impressive play that offers an awfully high-risk factor if you clip even a portion of Durant's hand. But, no contact and no foul and this game is tied for the first time since 0-0 and overtime will be required. Overtime required one gigantic moment. Tied at 105-105 with inside a minute to play, Kidd and Marion stole the ball from Durant (something that they both appear to be pretty successful at doing) and Kidd then made himself available in the corner in case Dirk needed an outlet. Nowitzki went right off the high post but as the traffic came to him, he kicked it out to the always-composed Kidd in the right corner. A pump fake to lure Westbrook into the air and then a 3-point bomb that proved to be the winning moment was provided by the oldest man on the court. A few free throws later, and the Mavericks performed a historic smash-and-grab heist of Game 4. Dominated for most of the night and with plenty to examine moving forward, the Mavericks ripped out the heart and likely the hope of the young Thunder and their fans in those final 5 minutes in the 4th Quarter. It again showed determination and will of the highest amount. It showed that this team can beat you in many different ways and that you better not consider a game in the bag until all of the time has expired. Any of us who think we know what lies ahead are deluding ourselves. There are so many unexpected turns in the road that nobody can predict it seems. But, this Mavericks team - despite some faults that put them in some very undesired situations - has a resolve that champions are made of. Only time will tell if they will be called champions. But, they can win the Western Conference crown in front of their home fans and against a demoralized opponent on Wednesday night. Email Bag: Bruce Carter to SS?